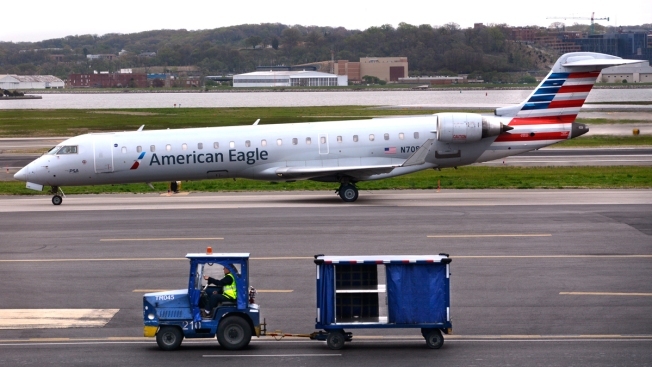 An American Eagle Bombardier jet taxis to a gate after landing at Ronald Reagan Washington National Airport in Washington, D.C.
American Airlines says it has "stabilized" a computer system that failed at one of its affiliate carriers, causing the cancellation of 2,500 flights over the past week. "It's a hardware issue that was causing some of our applications to run really slowly," American Airlines spokeswoman Katie Cody said Tuesday. She said employees tried to work around the problem, "but the application was running so slow they just couldn't keep up." Cody said there would be some cancellations Wednesday as the airline repositioned planes and crews — FlightStats showed about a dozen. Regional carriers use smaller planes, and they often fly passengers between hub airports and smaller cities. In Charlotte, PSA operates about 55 percent of the parent company's schedule — more flights than American's own, larger planes. The duration of the PSA outage — six days — and the number of canceled flights exceeded many recent technical outages at much bigger airlines. In 2016, Delta Air Lines canceled 2,300 flights and Southwest Airlines dropped more than 2,000 after separate computer outages.